Diabetic nephropathy (nephropatia diabetica), also known as Kimmelstiel-Wilson syndrome, or nodular diabetic glomerulosclerosis and intercapillary glomerulonephritis, is a progressive kidney disease caused by angiopathy of capillaries in the kidney glomeruli. 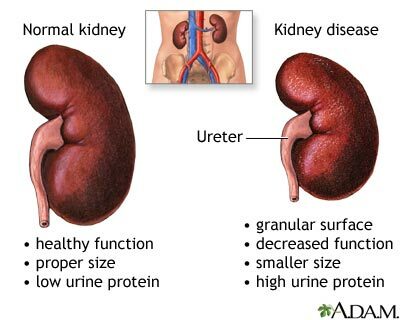 It is characterized by nephrotic syndrome and diffuse glomerulosclerosis. It is due to longstanding diabetes mellitus, and is a prime indication for dialysis in many Western countries. The syndrome can be seen in patients with chronic diabetes (usually less than 15 years after onset) after about 5 years in type 1 diabetes. Clinical nephropathy secondary to glomerular disease usually manifests 15–25 years after diagnosis of diabetes and affects 25-35% of patients under the age of 30 years. It is the leading cause of premature death in young diabetic patients. (between 50 and 70 years old). The disease is progressive and may cause death two or three years after the initial lesions, and is more frequent in men. Diabetic nephropathy is the most common cause of chronic kidney failure and end-stage kidney disease in the United States. People with both type 1 and type 2 diabetes are at risk. The risk is higher if blood-glucose levels are poorly controlled. Furthermore, once nephropathy develops, the greatest rate of progression is seen in patients with poor control of their blood pressure. Also people with high cholesterol level in their blood have much more risk than others.